In the summer of 1881, Robert Louis Stevenson holidayed in a cottage in Braemar. To amuse his step-son, during what turned out to be 7 rainy weeks, he wrote the first 15 chapters of Treasure Island. Join us for a convivial evening of poetry, readings and characters as we celebrate his connection with the village. Enjoy a glass of prosecco, a 3-course dinner and a glass of wine. We guarantee the vittels will be much better than on board the Hispaniola! 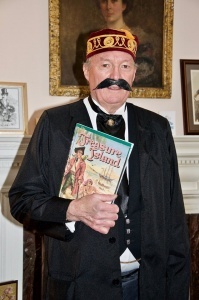 Come as you are or as one of Stevenson’s colourful characters – Dr Jekyll or Mr Hyde, Long John Silver or Alan Breck Stewart for a fun night celebrating the genius of RLS.